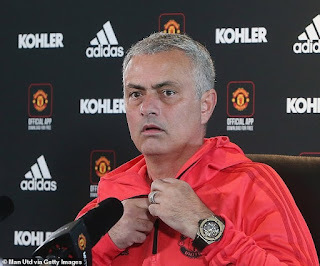 Jose Mourinho has promised to control and respect himself when Manchester United take on his former club Chelsea at Stamford Bridge on Saturday. The Portuguese coach made the statement while addressing journalists at a press conference this afternoon. According to him, if his side pulls off a shock win against his old club, Chelsea, he wouldn't rub it in their faces. 'Would I celebrate like crazy my team's goal at Stamford Bridge or my team's victory at Stamford Bridge? 'I don't think so, I think I would try to control myself and to respect the stadium and the supporters that were my supporters and stadium for many years. 'I would think which stadium I am in, which public is in the stands but apart from that it is another match for me. 'I want to do well for my team, players and support.